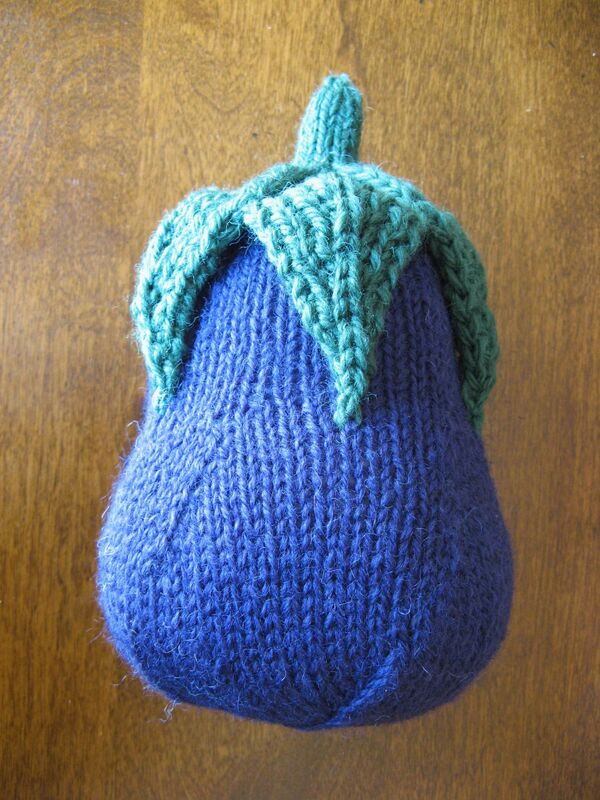 Finished Friday: Knitted Eggplant and What’s Next? This week I decided to try another project from Amigurumi Knits by Hansi Singh. I made the eggplant because I was curious about the leaf cap. 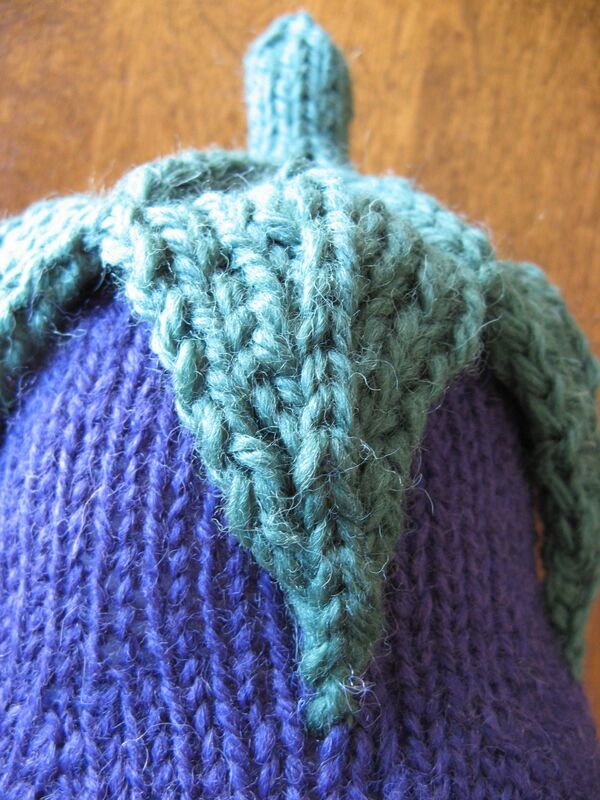 I’d already seen from the photos in the book that you knit the cap first, then pick up stitches on the underside and knit the body of the eggplant from the top down. What I didn’t realize is that the shape of the leaves is part of Singh’s elegant knitting design. The vein down the middle of the leaf is made with a 3-to-1 stitch decrease* that gives the leaf its triangular shape and also makes it arch out like a cat’s claw. The curve you see in the leaf from the side is not because of the stuffing, but because of the knitting. Detail showing the leaf vein made by the decreases. I’m totally geeking out over this because the shape is like a talon. (It flattened out some when I sewed them down). I made notes for later so I can use it to make dragon claws one day. Learning about this single stitch made the whole project worth my time. Meanwhile, a friend asked me this week how my search for my next creative ladder was going. I had to admit that I haven’t spent any time in my studio, not for months. I’ve been busy writing for my blog and researching for my novel and now that the weather is good, there’s gardening and yard work to do. I have been learning to spin yarn and experimenting with knitting, but I don’t feel like I’ve found what I was looking for yet. I decided I should head back into my studio and at least do a little mindless sewing in the hopes it would help me spot my missing ladder. When I opened the door, I got a shock. Apparently, my house-elves have been stashing all the stray stuff in this room since March. The piles had built up to the point that there was no free table space to work on. I spent the time I had putting fabric away so I have one open table, but I need to tidy more so I can breathe in there. My goal for this coming week is to make time to be in my studio. While I love writing, I know I need some of my creative work to be tangible, objects I make with my hands, in order to feel balanced, healthy, and happy. With any luck, I won’t spend the whole week cleaning. *For the curious: the decrease stitch used is Sl2-K1-P2SSO on right side rows only. The rest of the leaf is a simple K1-P1 rib with some adjustments to allow for neat edges and the center decrease.